Discipleship always comes with skin on (how blessed are even the feet of those who bear good news! ), and in my case God sent Gifford Claiborne to make a disciple out of me. Humorously (to Gifford, anyway), I was not much discipled when we met–this despite my having served for three years as an associate pastor just prior to our meeting for the first time. 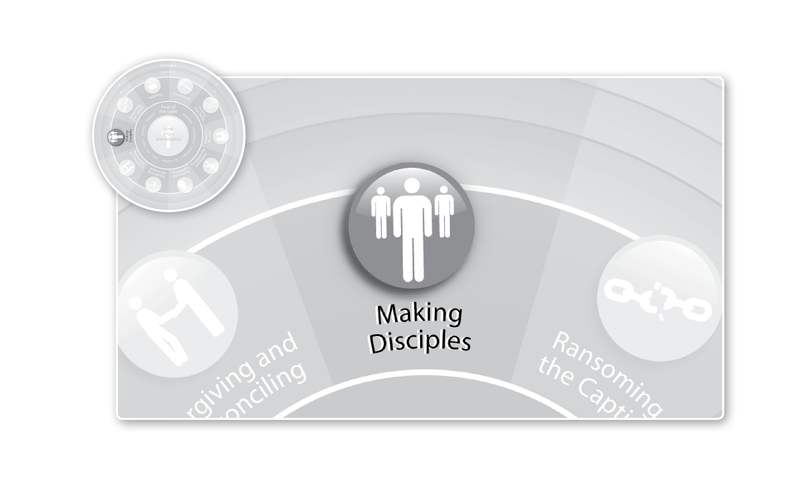 I had bumped up against discipleship practices a few times at the church I’d served, most particularly as we implemented an Every Member in Ministry campaign. But I prized Every Member in Ministry mostly as a volunteer activation approach. The idea of teaching others to obey everything Christ commanded? That seemed to me to be a call to use the lectionary when preaching. That was about as deep as it went for me. “Oh, I think there are a lot of contemporary ailments that in Jesus’ time would have been called demon possession,” I said, always happy when I sensed an intellectual conversation dawning. And that was the way Gifford discipled. It was never next to life, or outside of life, or reflecting on life. It was always in life–in real time. Obeying Christ without warning in whatever situation arose. And oh, the situations that arose! I would have been lucky just one time to sit and philosophize idly about discipleship with Gifford over coffee! Gifford would take me to meetings with the many famous and desperate Christian leaders who were always seeking him out because they badly needed his help, typically in fund raising but often in very personal and private issues ranging from marriage to addiction to lawsuits. They were always very excited to see him. But when Gifford would show up with 22-year old me in tow, their response was always somewhere between puzzlement and resentment. They wanted private time with Gifford. I knew that. They knew that. But Gifford seemed oblivious to it. “This is Eric Foley,” he would say. “He is a student who will one day surpass the teacher.” He’d chuckle. They’d frown. And then they’d really frown when they’d pour their heart out to Gifford and he would turn to me and say, “What do you think they should do, Eric?” My jaw was permanently slacked around Gifford. Gifford opened up each element of his personal and professional life to me, as if a very important reason he had a personal and professional life at all was to use it to train me. I simultaneously smile and wince as I think back on all the bad advice and prayers and ministry I dispensed to Gifford’s friends and colleagues as Gifford subjected all of us to his training me. He truly withheld no opportunity from me that he felt would help me grow in Christ. I marvel at it still. It simply is absolutely true that no project was ever more important to him than discipling me and the others whom God entrusted to his care. I learned to take the same approach in my own life, specifically because Gifford lived it out in front of me. I drafted a lot of fundraising letters and marketing materials in those days, and every time–every time–I sent a piece to Gifford for his approval, he’d send it back to me marked up with more red marks than the previous version I’d corrected just as his red pen indicated I should. 12 Not that I have already obtained this or am already perfect, but I press on to make it my own, because Christ Jesus has made me his own. 13 Brothers, I do not consider that I have made it my own. But one thing I do: forgetting what lies behind and straining forward to what lies ahead,14 I press on toward the goal for the prize of the upward call of God in Christ Jesus. 15 Let those of us who are mature think this way, and if in anything you think otherwise, God will reveal that also to you. 16 Only let us hold true to what we have attained. Brothers, join in imitating me as I imitate Gifford imitating Christ. Make disciples in this way, the way of real life, drawing them out of their heads and into the craziest and scariest parts of the world God has made, for the sake of growing each of us, with the assistance of men like Gifford, to fullness in Christ. This entry was posted in Making Disciples and tagged Gifford Claiborne, Imitate me as I imitate Christ, Making Disciples, Work of Mercy. Bookmark the permalink. Thanks for warming my heart. What a great blessing Gifford was in your life, mine and many others. He’s the real deal. Amen, Jim! Good to have a little Los Angeles Mission online alum convo here this AM! Whassup Jim? Where are you and what are you doing? Thank you for your kind words re me and Eric. Warm personal regards to Damaris. We remember our visit with you two in Tampa with warm feelings of love. God bless. Shocked! Thats what I was, and then blessed! as I thought over the days, weeks and months we have spend together. For me…it was all good. I never had so much delight as that I had in fellowship with you. Was it discipleship? I guess so…..in a unique sort of way. I was sincerely invested in seeing you pass me up and fly by…..in development and in spiritual life. I was not disappointed. Thanks for such a thoughtful tribute to our lives together. And they’re not over yet. There’s more to come. PTL. Love you Eric. God bless. As our old pal Cedric would have said, I love you back, Gifford! I praise God for all of it, and for all that is yet to come. We’ll pray for it, JT! Well said. Well said. Well said. What a great man of God, and what a blessing he has been to so many in Rescue Mission ministry who never even met him. I can hear Gifford’s wonderful baritone voice in your quotes of him. I too, am so grateful to have had a similar mentor/discipler by the name of Malcolm Lee. I just wish I had been more receptive. Great insights, all! There’s good discipleship learning here for all of us. Eric, Giff is discipling me now as I am learning to trust God with my finances! I just googled his name and found this blog. Great work Eric. By the way, it would be great to connect with you again sometime soon. Give me a call when you have time brother. Press on! Good to hear from you, Ken–and great to hear you’re meeting with Gifford. None finer. Give our best to Ali! As Gifford contributed so powerfully to who and where you are now, then we are greatly indebted to him, too. P.S. Yes, we will join you in growing each person God has entrusted to us into fullness of Christ by the power of the Holy Spirit.